The perils of climate change were first introduced to the world in 1968. It was then that the renown Stanford Research Institute (SRI) published its report, called Sources, Abundance, and Fate of Gaseous Atmospheric Polluters, warning everyone that a steady increase in levels of carbon dioxide being released into the atmosphere were unnaturally warming the Earth. Yet, nine years passed before the now-oft-used term “global warming” appeared in any academic literature and another 20 years went by before Congress heard from the experts that worldwide temperatures were increasing, polar ice caps were melting and sea levels had risen about half a foot since sometime in the 1800’s. In California, home of the shrillest of the shrill advocacy to curb global-warming – and only after the abysmal failure of the latest environmental fad (“smart growth”) – it took lawmakers nearly half a century to act. What were environmentalists, lawmakers and other political leaders – the same folks who endlessly tell us that global warming is the greatest existential threat to the planet since the proliferation of nuclear weapons – doing all that time? Indeed, the late ‘60’s, early ‘70’s, when the SRI report was first published, represented the most thorough, enlightened environmental thinking ever, said the advocates and pundits. That’s when the nation, California especially, was worried about urban sprawl, coastal land protection and endangered species preservation. It was then that the most sweeping environmental-protection laws ever were enacted – the National Environmental Protection Act (NEPA) and, stateside, the California Environmental Quality Act (CEQA). The federal Clean Water Act became law in 1972, shortly after California began regulating water. Also, mindful that increases of carbon-dioxide in the air was bad – and with the vehicle population in California growing like topsy – it was during this period the state began setting auto-emission standards and, by law, it systematically removed lead from gasoline. Time was clearly running out on the use fossil fuels for transportation and California’s love affair with them was coming to an end. Those were all economically wrenching changes the nation was forced to adopt in the name of environmental protection. Commerce had to adjust to this new regime and here in California, for the most part, it did. There were new costs to businesses and new costs to consumers, but all were eventually absorbed. Why global warming wasn’t managed at the same time isn’t known. Surely, the data existed. The needed advocacy was in place and seemed to be accompanied by the necessary political will, even if it was reluctant. Of course, businesses then as they do now would resist the mitigation called for by global-warming reform if it had too great an impact on the national (and global) economy – its costs would have to be few and reasonable. And, to its beneficiaries – people and polar bears – the reforms would have to deliver true relief. Yet, nothing happened. Is it possible that the players involved weren’t ready to take on something as large and sweeping as global warming? Was it possible that growth control, oppressive land-use regulation and limiting immigration had to play themselves out first? Or, did a state like California have to go through an energy crisis (as it did in the late ‘90’s)? Or, did it have to suffer from a sustained drought (as it did in the early part of the current century, after years of watching precious water resources wash out to sea)? Or, did it have to transform (however unsuccessfully) single-occupancy vehicle trips into rail passage (both light and high-speed)? Or, did environmentalists and their pals in Congress and the state Legislature want all of these cataclysms to occur simultaneously forcing business to choose “death by a thousand cuts” as the optimum way to go? Whatever the reason, if you’re a true environmentalist not taking up global warming during the ‘70’s was probably an opportunity missed. For a while back then, it seemed like the environmental zeitgeist was going to prevail forever, no matter what the cost. Now, happily, there is at least greater awareness of environmental extremism and its economic impacts. If you were concerned about the national and California economies then – and their corresponding growth rates – you must have been somewhat relieved, albeit temporarily, that nothing worse was done. (Of course, since then subsequent legislation, regulation and general policy-making has thwarted efforts to minimize the environmental mitigation impacts – including those that can be tied to global warming – on business and consumers.) Could it have been the initial successes the environmental community was having in the early ‘70’s – and their effect on both the national and state economies – put the kybosh on the advancement of global-warming mitigation measures? Maybe. Nevertheless, today at least two key questions remain: If concerns over the impact of global warming on the economy prevailed then, what’s changed? And, why are we going through all of these (silly) climate-change theatrics now? Compassion for a child in distress is automatic. You do everything you can for that child. You use all the resources you can muster. But what if an entire continent is in distress? What if billions of children are in distress? This is the question for which there are no easy answers. Because across the developing world, billions of people still endure political violence and extreme poverty. The most afflicted nations are almost always the nations experiencing rapid population increase. And the solutions being proposed, mass immigration and rapid transition to renewable clean energy, require authoritarian, global governance that will rob the people of the developed world of their freedom and prosperity, at the same time as it does little or nothing to help the people living in the developing world. But it is the path of least resistance. The reason for pursuing flawed solutions has more to do with where the global elites mean to apply authoritarian pressure than with whether or not more lives will be improved, or the planet’s climate will be preserved. Before exploring alternative solutions, the scope of the challenge should be quantified. The best way to do this is by reviewing trends in global population and energy consumption. The figures to be presented draw on two sources, the World Bank Population Estimates and Projections, and the BP Statistical Review of World Energy. 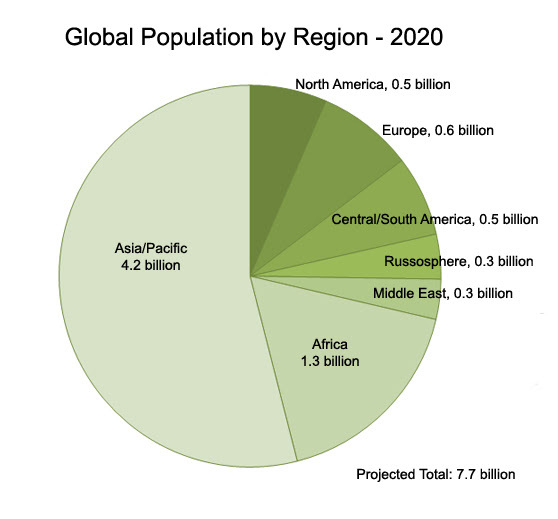 The two pie charts below depict projected global population by region in 2020, and 30 years hence, in 2050. They are sliced by region, with the categories as defined by British Petroleum in their annual energy review. The “Russosphere” refers to the nations of the former Soviet Union that have not joined NATO. The other categories are fairly self explanatory. As can be seen, more than half of the world’s 7.7 billion people — 4.2 billion — live in the Asia/Pacific region, including the demographic heavyweights of China, India, Pakistan, Bangladesh, and Indonesia. As can be seen, five of the other six regions have between 0.3 and 0.5 billion people each. The exception is Africa, with a projected 2020 population of 1.3 billion. What happens between 2020 and 2050 is extremely significant. First, note the diameter of the second pie chart. 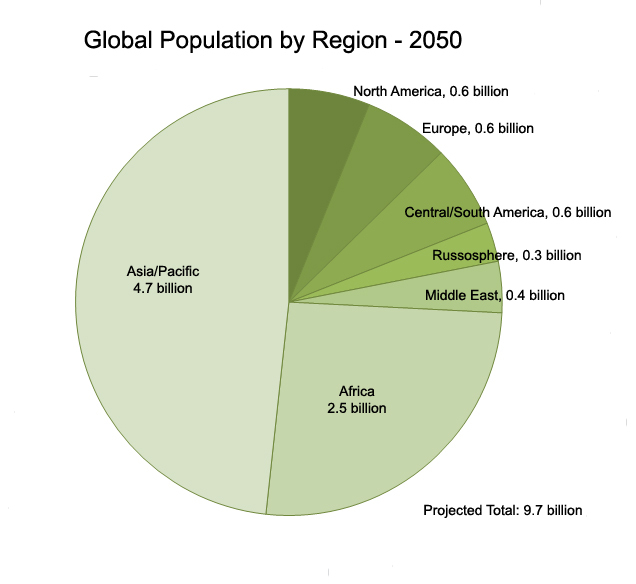 The increase in area is exactly proportional to the projected increase in global population between 2020 and 2050. As can be seen, in terms of people inhabiting planet earth, the footprint doesn’t get all that much larger. The world’s population will grow by 25 percent. But where will this growth occur? The projected population in the Asia/Pacific region will grow by a half-billion, and the population of the six other regions excluding Africa will increase from a total of 2.2 billion in 2020 to 2.5 billion in 2050. Africa, by contrast, will roughly double in population, from 1.3 billion to 2.5 billion. That is, over the three decades between 2020 and 2050, Africa will add 1.2 billion people to its population, whereas the rest of the world combined will add another 0.8 billion. If projected population growth were spread evenly among nations over the next 30 years, that would pose a different set of challenges. But the problem we face is that between now and 2050, two-thirds of the world’s population growth will occur on the most undeveloped, poverty-stricken continent on earth. To understand just how inadequate current globalist policies are with respect to immigration and energy, especially when facing an exploding population among the most undeveloped nations on earth, global energy trends offer clarity. 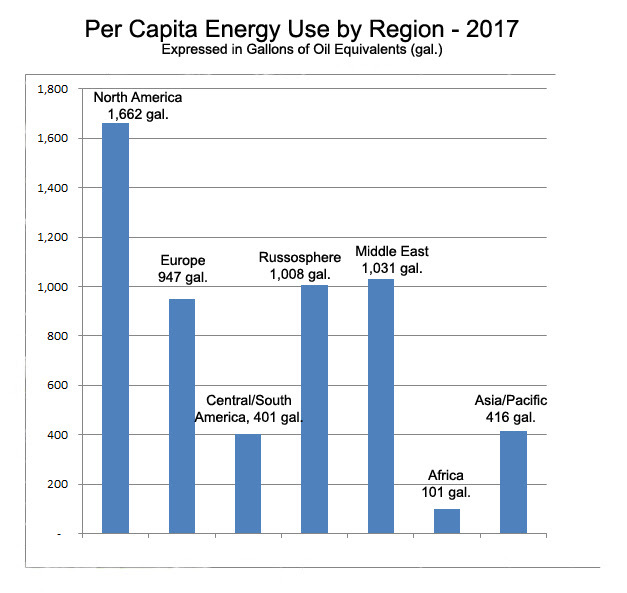 The next chart shows per capita energy use by region last year. To make the data as intelligible as possible, all energy use — from wood burning to nuclear power — is normalized and expressed in terms of gallons of oil. The differences between regions are profound. As shown, the average North American—that includes citizens of Canada and Mexico, along with the United States — consumed energy last year equivalent to 1,662 gallons of oil. That’s nearly twice that of the other relatively heavy energy consumers in Europe, the Russosphere, and the Middle East, and it’s nearly four times more than in Central or South America, or in the Asia-Pacific. But take a look at Africa. The per capita energy consumption by Africans in 2017 was equivalent to 101 gallons of oil. Less than one-sixteenth the amount of energy North Americans consume. 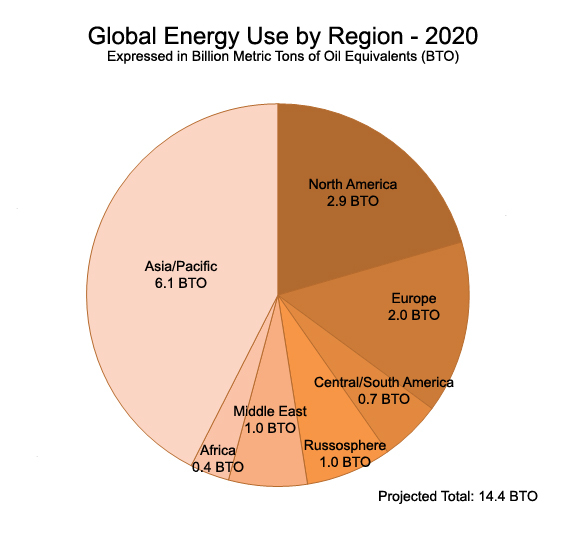 The next chart shows projected global energy use by region in 2020. It is derived from the data shown on the previous pie chart depicting global population by region in 2020, multiplied by per capita energy use by region. The units expressed are “billion tons of oil equivalents,” that is, they depict how much all worldwide energy use would be, if the energy used were exclusively oil. By the way, for the uninitiated, this is a common practice among energy economists in order to show the relative proportions of energy production and consumption in normalized units. A gallon of gas contains within it 120,429 British Thermal Units, or BTUs, of energy; one kilowatt-hour contains 3,412 BTUs. You can convert all types of energy to, to name a few common examples, BTUs, or joules, or metric tons of oil. Take your pick. It is obvious from looking at this chart that North America and Europe use far more energy than the global average. Equally obvious is just how small Africa’s slice of global energy consumption is currently, only 3.3 percent of the total despite representing 17.4 percent of global population. So how will this same chart look in 2050? 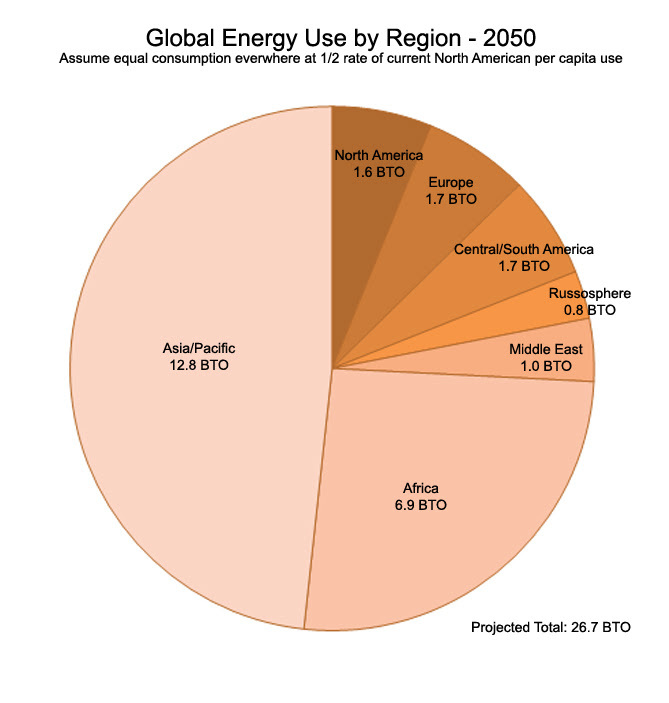 Below is a pie chart showing one scenario for global energy consumption by region in 2050. First consider the area of the chart, which is exactly twice that of the pie chart for 2020. For the purposes of this analysis, imagine that total energy consumption worldwide will double by 2050. Further suppose that the per capita consumption of energy worldwide will be allocated equally to every human on earth. The implications of these assumptions provide useful insights. For starters, if energy were consumed equally everywhere, and the total amount consumed were doubled, that would require North Americans to reduce their per capita energy use by 50 percent. In reality, Americans, who consume more energy per capita than Canadians or Mexicans, would have to reduce their per capita energy use by morethan 50 percent. This bears repeating: If global energy consumption doubled, the per capita energy available worldwide would be less than half of what Americans currently consume. This isn’t a value judgement. It’s just basic algebra. Next, note the African slice of this energy consumption pie for 2050. At the energy equivalent of 6.9 billion tons of oil, for the Africans in 2050 to enjoy less than half as much energy as Americans currently enjoy, they would consume a quantity of energy equal to half of all energy consumed worldwide today. And to accomplish this by 2050, energy consumption in Africa would have to increase by a factor of 36. These are mind-boggling statistics. Yet they perfectly illustrate the magnitude of the development challenge facing Africa, insofar as access to affordable energy is one of the prerequisites to reducing poverty. It is into the granite face of these immutable demographic and economic facts that the agenda of the renewables lobby collides. Global population and energy trends indicate that the production of energy will need roughly to double in the next 30 years in order to better assure a peaceful evolution of the most economically and politically fragile regions in the world. 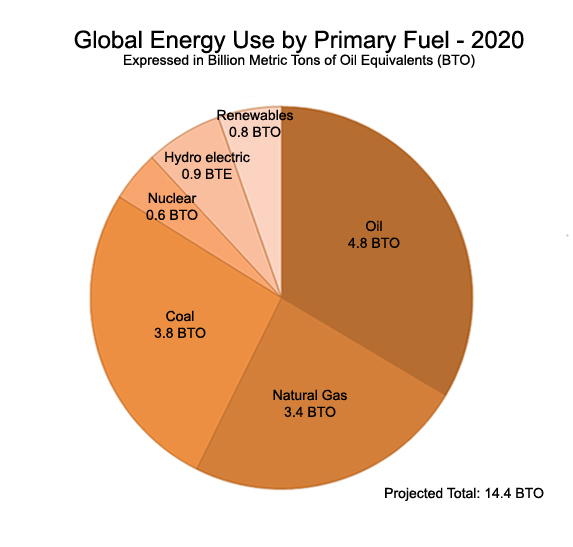 The next pie chart, resized down to the 2020 projected total global energy consumption equivalent to 14.4 billion tons of oil, depicts renewables as producing a 0.8 billion-ton-oil equivalent of the total, or 5.6 percent. This 2020 projection, by the way, relies on continued rapid growth of renewables over the next few years, based on the increase of 16.6 percent between 2016 and 2017. In 2017, renewables only provided 3.6 percent of total global energy. These 2020 projections are a best case scenario. Now imagine this pie chart again doubled in size. Imagine renewables providing 100 percent of this total—the equivalent of 26.7 billion tons of oil. Does that sound ridiculous? Maybe it does, but going “100 percent carbon free” by 2045 is the goal of recent legislation in California. To do this worldwide between 2020 and 2050 would require renewables to increase by a factor of 34 (from 2017 levels, 55). Imagine wherever you see one windmill, there are 50. Imagine wherever you see a stretch of open space covered with photovoltaics, you see 50 times that much area so covered. Imagine the footprint of these devices, their cradle-to-grave environmental impact. Their contribution to the heat-island effect. Their contribution to avian slaughter, their consumption of land and air. Imagine the ecological impact of producing, maintaining, and reprocessing batteries capable of storing tens of thousands of gigawatts, all over the world. Imagine the cost. Fact is, we are not going to run out of fossil fuels. At current rates of consumption, proven reserves of oil will last another 179 years; natural gas, 54 years; coal, 505 years. Over the past several years, these reserve ratios, reported on the basis of proven, economically recoverable reserves of fossil fuel resources, have been increasing, not decreasing. “Proven” reserves of conventional fossil fuel will continue to increase into the foreseeable future, without even accounting for vast deposits of so-called unconventional reserves such as methane hydrates. Doubling energy production worldwide within 30 years is a daunting challenge. It is impossible quickly to achieve that goal without fossil fuel, and concern about running out is unfounded. It goes beyond the scope of this analysis thoroughly to assess the cost and environmental impact of installing wind and solar systems, along with grid upgrades and mega-storage. Suffice here to say their environmental impact, their scalability, their sustainability, their practicality, and their cost are all problematic. Similarly, it goes beyond the scope of this analysis properly to debunk the climate hysteria that is used as cover for this astonishingly flawed approach to delivering adequate energy worldwide. But given the incendiary nature of any flirtation with climate change “denial,” here are links to a few noteworthy climate contrarians: Jo Nova, Judith Curry, Roger Pielke Jr., Marc Morano, the Heritage Foundation’s Environment website, JunkScience.com, the Science and Environmental Policy Project, Watts Up With That, and Bjorn Lomborg. Please note: these websites range from blatantly insouciant to eminently measured, but all of them offer valuable information. It is necessary, however, to connect climate alarmism not only to flawed energy policies, but also to futile immigration policies. The argument goes something like this: Because imperialist Western nations rapaciously exploited resources in the developing world, they impoverished these nations. At the same time, the Western nations burned fossil fuel, which created droughts and extreme weather in the developing nations, which further worsened their plight. For these reasons, Western nations must admit refugees from developing nations, because if the West had left these countries alone and if the West had not ruined their climates, these nations would be thriving. At the same time, and for the same reasons, Western nations must pay reparations to developing nations, in order for them to recover from the damage caused by the West. There are two mind-numbingly obvious flaws to this argument, even if you agree with its premises. First, the West cannot possibly absorb hundreds of millions of immigrants. Second, “reparations” in the form of foreign aid, at least to-date, are the real reason the populations in these nations continues to explode. But to propose alternatives, an uncomfortable fact has to be confronted. Africa is a welfare continent, and welfare for Africa has failed. Most evidence gathered over the past 60 years suggests that Africa is a welfare continent in some of the worst connotations of that term. For example, the average number of children in Somalia in 1960 was 7.3, but by the year 2000 that average had actually climbed to 7.6, suggesting that Western food aid and Western medicine lowered the death rate, and lowered infant mortality, but accomplished little in terms of female emancipation, or nurturing indigenous prosperity that correlates with lower birthrates. Somalia is typical. Burgeoning Nigeria, a nation projected to have 410 million citizens by 2050, saw average fertility decline only slightly, from 6.4 in 1960 to 6.1 in 2000. Fertility in Ethiopia, destined to have nearly 200 million inhabitants by 2050, went from 6.9 in 1960 to 6.5 in 2000. Average fertility in tiny Uganda, where more than 105 million people are expected to reside by 2050, went from 7.0 in 1960 to 6.9 in 2000. Estimates for 2020 are just that: estimates. There is no hard evidence that the population rate of increase in sub-Saharan Africa will slow sufficiently for Africa’s projected population in 2050 to “only” reach 2.5 billion. The ironic reality is that Africa quite likely would have been better off if no foreign aid, at least as it was formulated, had reached its shores after 1960. Not only did foreign aid play a vital role in enabling Africa’s population to have already more than quintupled since then and now, but to the extent that foreign aid was feeding people in nations that should have been developing their own rich agricultural potential, or providing medical treatment to people in nations that as a consequence had less incentive to train their own doctors, the aid instead went into the pockets of corrupt dictators who had no interest to invest in a brighter future for their nations. The hard choice comes down to how the powerful Western nations want to apply their wealth and influence to help humanity and heal the planet. The path we’re on requires shoveling billions in food aid and medical aid to developing nations, with the utterly unsustainable result being exploding populations in societies that don’t evolve and advance internally, because they don’t have to. The path we’re on requires a parallel campaign to import as many refugees as possible from these developing nations, with the only result being increasing economic burdens on the host nations, and increasing political and cultural conflict in the host nations, with negligible quantitative impact on the destitute and expanding populations of the source nations. The path we’re on demands a preposterous renunciation of fossil fuel, despite fossil fuel currently providing 85 percent of all global energy, despite the fact that fossil fuel will remain cheap and abundant for at least another generation, if not much longer, and despite the fact that global energy production needs to double in the next 30 years, and nobody has any idea how else that can be accomplished. Globalism, which underlies these supranational strategies, especially in the context of climate change and immigration, has become a particularly malevolent version of imperialism turned inward. It is an authoritarian response to challenges that are indeed existential—exploding populations of destitute nations, an insatiable global appetite for more energy, and environmental degradation. But it is precisely the wrong response. What happened? The reason globalism has turned against the populations of developed nations is because that is the path of least resistance. To intervene in Africa, or Honduras, for that matter, with solutions that would work, would revive accusations of imperialism, while simultaneously enraging environmentalists. It is easier for Western elites to blame their own societies for the misery in the developing world. It is easier to import people from the developing world, saturating them with anti-West, redistributionist propaganda, and to bring enough of them in to change the political equation in those nations forever. This strategy is the easiest path towards granting the Western elites carte blanche to continue down the path we’re on. But it’s the wrong path. The effect of these policies, already well underway, is to exploit the populations of the developed nations, artificially inflating the prices they pay for everything; energy, water, transportation, housing, land, in the name of social equity and saving the planet. The benefit to the elites who own the artificially constrained productive assets is more profit—as costs remain flat and competitive supplies are restricted, profits go up. That is happening today. The entire scheme is dangerously untenable. Eventually people in the developed nations will rebel—both against the engineered scarcity and against each other in a needlessly fractured culture. And eventually people in developing nations will starve by the millions, if not billions, as Western food and medical aid cannot keep pace with rampant population growth. Those worried about the climate consequences of the alternative strategy—competitive abundance—should ask themselves what’s worse: a climate that may warm incrementally, possibly due in part to burning of fossil fuel, or another 2 billion people, desperate and destitute, stripping the rainforests for fuel, and wiping out the last great remnants of wild game for the protein. Western elites must support responsible but competitive and accelerated development of all natural resources, instead of pretending that scarcity will further the goals of social equity and environmentalism. The prosperity that ensues will lead to lower birthrates and urbanization, taking pressure off wildernesses. The increased wealth will fund environmental mitigation. Western elites must accept the inaccurate but virulent moral opprobrium that will accompany actually investing in places like Africa, as opposed to merely sending food and medical aid. They must embrace compassionate nationalism. They must accept alternatives to the de facto nihilism of mass immigration. Throughout the developing world, and especially in Africa, Western elites must invest in clean fossil fuel, electricity grids, nuclear power, hydroelectric power, inter-basin water transfers, heavy industry, aquaculture, mega-cities, and universities. To protect their investments, they may have to negotiate charter cities or charter regions with the host nations, where Western laws will be enforceable by Western nations. Achieving stability in these areas won’t be easy. It will invite accusations of imperialism. It may also enable a bright future for not millions, but billions of children. And maybe it won’t work. But it’s better than the path we’re on. Putting aside questions of effectiveness and even validity of the satellite project proposed by Gov. Jerry Brown at his Global Climate Action Summit, we should be concerned that the satellite could emulate the high-speed rail in that the costs will not be covered as promised and that taxpayers will end up holding the bag. Clearly, the state–that is the taxpayers–are expected to chip in for the satellite project. More is expected from outside sources such as business and others. But let’s not forget the promise of the high-speed rail: That it would be funded by the state, federal and private interests. Yet, no private money has come forward. Whether the state should even sponsor such an endeavor is not the issue here. The point to be considered is that given the situation with the rail, it would be best to have that money in the bank before setting off on this project; before the taxpayers are involved to a greater extent than desired. Will California embark on the satellite project on the hope that money will come from private concerns? As with the high-speed rail, will we see a General Obligation bond to help support it? Remember, the idea is not for one satellite but multiple satellites. No price tag was associated with the project so we can’t compare its costs to that of the rail project. But, who really knows the high-speed rail cost. It’s forever changing. Is that the future of the California satellite venture? If, in fact, taxpayer money is involved it should also come from taxpayers beyond California’s borders. The satellite monitoring will be world-wide and at a minimum the United States Climate Alliance made up of 17 states that are involved in the alliance should contribute because they would benefit from any information the satellites collect. On another level, you do have to hand it to a clever Jerry Brown for turning around the “Governor Moonbeam” moniker once given to him by Chicago Tribune columnist, Mike Royko, when Brown proposed California launch a satellite for a different purpose 40-plus years ago. While Royko declared the moniker “null, void and deceased” 15 years after appending it to Brown, the governor has come to embrace the nickname. With his latest satellite pronouncement, he turned a mocking handle into a mark of enlightenment. And to do so at the end of his term completes the circle of his time as California’s governor. But part of Royko’s complaint was the issue of cost and that nagging question of cost still exists. It is currently spoiling Brown’s signature issue, the high-speed rail. If the satellite proposal follows a similar path, it would undercut the now prized Gov. Moonbeam appellation. He’s mostly shed the “Governor Moonbeam” nickname, but Gov. Jerry Brown pointed California toward the stars as he closed out a global climate change summit here Friday. “We’re going to launch our own satellite — our own damn satellite to figure out where the pollution is and how we’re going to end it,” Brown told an international audience on the final day of the San Francisco gathering. California will work with San Francisco-based Planet Labs to launch a satellite capable of tracking climate-altering emissions, Brown said. The effort will lean on the expertise of the state’s Air Resources Board, which has taken the forefront in pursuing climate-related innovations. The governor’s choice of words in making the announcement deliberately echoed his late 2016 challenge to Donald Trump, amid rumors that the incoming administration would undercut NASA’s climate research role. Looking back, California’s flagship climate change policy Assembly Bill 32, the Global Warming Initiative was signed into law in 2006 when California was a minuscule contributor to the world’s greenhouse gases. Statistically, the World is generating about 46,000 million metric tons of GHG’s, while California has been generating about 440 million metric tons, which is less than one percent of the world’s contributions. Today, we’re constantly being bombarded with reminders and progress reports toward achieving California’s plans to reduce greenhouse gas emissions 40% below 1990 levels by 2030, and an 80% reduction from 1990 levels by 2050. Now, more than a decade since the passage of AB32, California remains as the most environmentally regulated location in the world, yet California still contributes a miniscule one percent, and has had little to no impact on the reduction of global greenhouse gas emissions. Very often, when our political leaders are confronted with the facts that California is one of the most business unfriendly states in the union, our politicians often reply, “yes, but we’ve got great weather”. Well, they’re right, California has the best year round weather in the nation and that has lead us to become the 6th largest economy in the world. With a robust economy, the good news is that we can “afford” to micromanage almost anything, but the bad news is that the costs associated with micromanagement are being born by the rich and poor and has contributed to California having the largest homeless and poverty population percentages in the nation to compliment the robust economy. California is an “energy island” to its almost 40 million citizens, bordered between the Pacific Ocean and the Sierra Nevada Mountains whose 35 million registered vehicles of which 90 percent are NOT EV’s are consuming DAILY: 10 million gallons a day of diesel and 42 million gallons a day of gasoline. In addition, the state’s daily need to support its 145 airports (inclusive of 33 military, 10 major, and more than 100 general aviation) is 10 million gallons a day of aviation fuels. No other State or Country has the stringent environmental regulations as California to keep greenhouse gas emissions in the world to a minimum, thus it’s imperative that California continue to promote in-state manufacturing of the chemicals and by-products, and aviation, diesel and gasoline fuels manufactured from crude oil on the California energy island. All those products from crude oil supports the military and all the California infrastructures, which are the basis of the prosperity of our growing population. The renewable sectors of wind and solar, like every other infrastructure, are dependent on the products manufactured out of crude oil for all their components so they can produce emission free intermittent electricity. With all the world’s efforts to protect life, United States wind farms are “legally” killing hundreds of thousands of birds, eagles, hawks, and bats every year, and it’s appalling that society has given the wind industry a FREE get-out-of-jail card! Bald and golden eagles are not endangered species anymore but are protected under the Bald and Golden Eagle Protection Act and the Migratory Bird Treaty Act. The bald eagle population is growing, while the golden eagle populations is declining. In 2017, the Obama administration finalized a rule that lets wind-energy companies operate high-speed turbines for up to 30 years — even if means killing or injuring thousands of federally protected bald and golden eagles. Under the new rule, wind farms may acquire an eagle “take” permit from the U.S. Fish and Wildlife Service (USFWS) that allows the site to participate in nationwide killing of up to 4,200 bald eagles annually, under incidental “take” permits without compensatory mitigation. If they exceed their eagle “take”, there are adaptive management measures designed for each project, that often include reducing operational hours if deemed necessary to reduce risk. It’s appalling that wind farms can legally obtain permits from the USFWS to kill those majestic bald eagles. The public, especially the homeless and poverty populations that have paid dearly for the micromanagement of our emissions and renewables, deserves to know the costs being incurred to reduce our minuscule contributions to the world’s greenhouse gases, and as a courtesy to provide emission free intermittent electricity, share with the public the total estimated impacts of all birds taken that are reported to the USFWS. In a recently published interview, Paul Hawken, an environmentalist, and Executive Director of Project Drawdown, a global coalition of researchers, scientists, and economists that models the impacts of global warming, made a spot-on observation about the pitfalls of seeking a simple, single solution to climate change. Nowhere is this truer than in California. In recent years, policymakers have increasingly aligned with advocacy groups pushing for one-track solutions to climate change, like 100 percent renewable electricity or all-electric buildings. Two weeks ago, Assembly Bill 3232 – legislation that aims to electrify homes and businesses in the state – passed through the Assembly Utilities and Energy Committee with little fanfare. There is a certain seductive simplicity to many of the single solutions aimed at addressing climate change. But, the math just doesn’t work. Moreover, the single solution policies that advocacy groups like Sierra Club are churning into new laws don’t take into account important considerations like affordability and the preferences of Californians. Take 100 percent renewable electricity, for example. A recent Black and Veatch analysis showed 100 percent renewable electricity could cost California $3 trillion and require 900 square miles of solar panels and another 900 square miles of depletable and unrenewable battery storage. That’s an area almost four times the size of the City of Los Angeles dedicated to disposable batteries and solar panels. For the price tag, you could buy Apple and have $2 trillion left over, eliminate a sizeable chunk of the US federal debt, or pay for private college tuition for about 25 million high school seniors. AB 3232 seeks to move California toward another one-track solution – all electric buildings. A report released earlier this month by the California Building Industry Association (CBIA) found that replacing natural gas in every home would cost California families up to $6 billion annually and require most buildings to undergo expensive retrofits. That’s an almost $900 increase in annual energy costs for every California family. As Hawken points out, people seeking a single solution to climate change simply haven’t done the math. Importantly, they also haven’t considered the preferences of California’s families and businesses. A separate CBIA study recently found that only 10 percent of voters would consider purchasing an all-electric home and 80 percent oppose laws that would take away their natural gas appliances. Does it make sense to charge Californians a lot more for something they don’t want in the first place? Moreover, would the increased burden on families and businesses address climate change? In California, a lot of work has been done to measure and model emissions linked to climate change. According to the California Air Resources Board (CARB), about 40 percent of all greenhouse gas emissions in the state come from the transportation sector, with heavy duty trucks being the single greatest source. Consistent with Project Drawdown’s analysis, agriculture and waste are also significant contributors in California. More than 80 percent of methane emissions in the state come from farms, dairies and landfills. In contrast, natural gas end uses in residential buildings account for about 5 percent of emissions statewide, according to CARB. Make no mistake about it, renewable electricity will play a crucial role in reducing emissions and reversing the effects of climate change. But, if California is serious about achieving the state’s ambitious climate goals we need all options on the table, including policies that reduce emissions from transportation and investments in technology that capture methane from farms and landfills for use as affordable and renewable energy. Doing the math shows us that California needs a balanced strategy – one that achieves climate goals, but considers the impacts on families and businesses. Affordability and choice matter. Bret Lane president & Chief Operating Officer for Southern California Gas Co.
A federal judge in San Francisco has ordered parties in a landmark global warming lawsuit to hold what could be the first-ever U.S. court hearing on the science of climate change. “This will be the closest that we have seen to a trial on climate science in the United States, to date,” said Michael Burger, a lawyer who heads the Sabin Center for Climate Change Law at Columbia University. By 2050, because of climate change, Oakland officials insist that the city faces dealing with “100-year” type floods every two years – or maybe it won’t have those floods. Apparently, that forecast all depends on who city officials are talking to – whether you are an energy company being sued by the city of Oakland demanding money because of the dangers climate change supposedly bring or you are an investor interested in buying an Oakland municipal bond. In the latter case, Oakland officials attest that the city is unable to predict the impact of climate change or flooding. This contradiction should be a concern to taxpayers and is worthy of the panel discussion scheduled at Pepperdine University’s School of Public Policy on Tuesday, February 27. The panel, which includes the Reason Foundation’s Marc Joffe and Chapman University Law Professor Anthony T. Caso, will focus on the lawsuits potential impact on municipal bonds and the ultimate effect on taxpayers. “The Unexpected Consequences of Climate Change on Government Finance” is scheduled to begin at noon at the Drescher Graduate Campus in Malibu. Within the past year, eight California jurisdictions have filed public nuisance climate lawsuits against a slew of oil and gas companies demanding millions of dollars to offset the certain dangers facing the jurisdictions because of climate change. At the same time, these local governments have reached out to investors to back local bonds, declaring in the bond prospectus that they cannot predict risks related to climate change. The trouble for taxpayers comes if the Securities and Exchange Commission seeks million dollar penalties from the governments for making false statements to investors. When a local government must pay a penalty it falls on the backs of taxpayers. Such a consequence could also lead municipalities being required to offer more disclosure and result in higher borrowing costs for future bonds. The integrity of the local governments and ultimately taxpayers’ financial responsibility is hanging in the balance. Joel Fox editor and Co-Publisher of Fox and Hounds Daily.